Broad Run Veterinary Service, Inc.
Broad Run Veterinary Service, Inc. is a full-service mobile equine practice with locations in Bluemont, Purcellville, and Herndon, Virginia. We provide health care and dental services in Loudoun, Clarke, Fauquier, and Fairfax Counties in Northern Virginia, as well as in nearby areas of West Virginia and Maryland. We are proud of our 28 years of providing a friendly, personal touch to our clients for their on-site equine veterinary needs. We offer both routine and advanced services, including lameness and pre-purchase exams, vaccinations, dentistry, performance and sport horse medicine, internal medicine consultations, Eastern and Western medicines and procedures, acupuncture and chiropractic treatments, and emergency care. We also work closely with other medical specialists and farriers to ensure that your horse is given the best health and medical care. 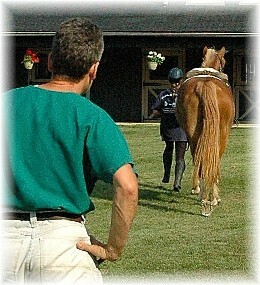 Our staff is dedicated to helping our clients with all aspects of care for their horses. We welcome you to call with any questions and look forward to providing you with the best in progressive, compassionate veterinary care.